This article originally appeared in T.H.E. Journal's October 2013 digital edition. A STEAM project at Taylor Elementary was painting the life cycle of flowers in the style of Georgia O'Keefe. Say you're the principal of a school that has been hit by an F5 tornado. No one is hurt, thank goodness, but teachers, students, and staff must move to a temporary school while your damaged school is repaired. Do you try to simply achieve a sense of normalcy during two years of displacement? Many principals would. And who would blame them? But Deron Cameron, principal of University Place Elementary School in Tuscaloosa, AL, saw the calamity caused by the April 2011 twister as an opportunity to do more. Armed with grants and donations from around the country, Cameron was determined to not only bring back some of the students his school had lost when the school moved, but to turn the misfortune into an advantage. "We met last year as a faculty and said, 'When we go back into our building, we don't want to do the same-old-same-old. We need to research some practices so it can be a win-win for our students,'" Cameron says. After investigating a handful of educational approaches that ranged from Montessori to STEM, Cameron and his faculty settled on STEAM, a curriculum based on science, technology, engineering, and mathematics--plus the arts. "We liked the arts in STEAM," Cameron says. "Our students have great creativity. We saw that the creativity of STEAM would add another facet." Other schools are taking up the STEAM approach, even without the hardship of displacement and rebuilding. They come to STEAM because they believe the arts are important, or because they want to reach all of their students, not just the ones who thrive on straight academics. Jeremy Ferrara, who teaches fourth grade at Taylor Elementary School in Arlington, VA, says that his "aha moment" came one Saturday a couple of years ago, when he watched a student from his class creating scenery for a school musical. "This kid wasn't very strong academically," Ferrara says. "I watched him working on the set for two hours, while he measured the cardboard and lined up the pieces. I didn't talk to him, I just watched. He was completely into it. And in the end, everything came out perfectly symmetrical. It just opened my eyes to the fact that I wasn't reaching this kid the right way." So how does STEAM work? Taylor Elementary had committed to what they were calling "STEM and Beyond." The "Beyond" part was a nod to the need for arts in the equation, but no one was sure exactly how to make that need a reality. Ferrara sought out music teacher Bianca Sanchez and art teacher Elizabeth Ashley and they began to address the problem collaboratively. They started with a lesson on kinetic energy, and when the students responded positively, they pursued additional subjects. Typically, the process begins with a brainstorming meeting. Ferrara describes an upcoming lesson, then works with Ashley and Sanchez on some potential strategies for working the subject matter into their art and music classes. One such lesson was on the plant lifecycle, an area where students had had low test scores. Ferrara showed Sanchez and Ashley the lifecycle and the standards he had to teach. "Once we understood the science part, we had to see how to connect our own areas," Sanchez says. "For music, I don't want the kids to just sing songs on the subject. I try to find a deeper connection." To make this deeper connection, Sanchez turned to the music of Philip Glass. "We studied the basic structure of the music, how it starts off simple and slowly changes structure in a way that reminded me of the plant," Sanchez says. Then the kids used GarageBand to create their own compositions to represent the stages of the plant lifecycle. They presented their music to the class, describing how each structural change in the composition reflected a new stage in the cycle. 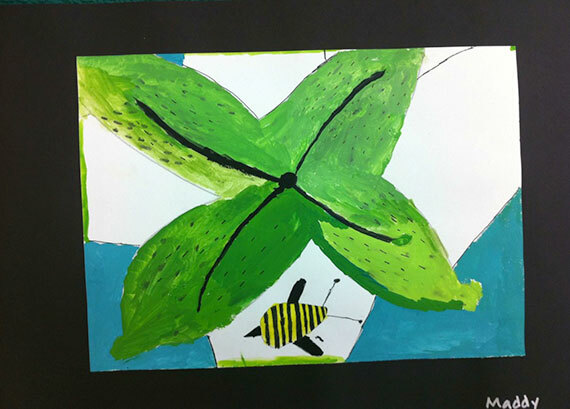 In Ashley's art class, the students studied the paintings of Georgia O'Keefe, and how she "zooms in" on the flowers. Ashley says, "I asked, 'How could you use this technique of zooming in to show a lifecycle of a plant?'" The students came up with a wide variety of depictions. One of Ashley's favorites was a painting in which the student started with a giant yellow circle to represent the sun, on which the student painted a teardrop to represent the plant's need for water, and within the teardrop, a plant. For Ferrara, the great success of projects like these is that the students are depicting and describing abstract concepts that were previously extremely tough for some of them to grasp, much less articulate. Now he can see and hear how the students see and hear these concepts. While their STEAM approach has grown organically, the team of Ferrara, Sanchez, and Ashley is hitting on some of the tenets of more formalized STEAM programs--in particular, the collaboration that must take place between teachers who are accustomed to keeping their lessons separate. Georgette Yakman, who designed a STEAM curriculum that she tailors around individual schools' community and demographics, says that achieving this collaboration is one of the biggest challenges to implementing STEAM. "Physically, it's a huge administrative struggle. How to get the teachers together time wise," Yakman says. To address this, Yakman has created a framework for putting together STEAM educator teams in which "everybody has buy-in and a say in the curriculum, so when they are making assignments, their specialty is recognized and they have to contribute to the thematic plan." Yakman's STEAM approach also includes collaboration with the school's community. She researches a school's geography and the overall demographics of the region, and helps teachers reach out to local businesses or agencies to partner with. The partners, in turn, expose students to a range of potential future occupations that's broader than the standard pro athlete, doctor, lawyer, pop star list that most students carry. One of Yakman's schools worked with the town's city planner. Students were designing a city, and before they could place their buildings (built of cereal boxes) on the city grid, they had to get the design approved from the real-life city planner. After that lesson, students went around the school community talking about becoming torque specialists. Another class she worked with teamed up with the local fire department. When firefighters visited the class, they brought a poster they had made that showed how their jobs incorporated all areas of STEAM. For the arts, they described the psychological support that they must offer victims of fire, as well as fire history that they learn in their courses, and even representations of fire in cave art. Student collaboration is also key to the STEAM approach. "A STEAM team is more like a business team," Yakman says. "We have trained them as individuals. If we put them in teams where they have to work with each other's strengths and weaknesses, they come out into the world, and they have the experience of working together." The Taylor Elementary teachers stress collaboration among students as well. "They're afraid to work together because they're afraid someone is going to steal their ideas," Ferrara says. One major success, therefore, was a project where students teamed up, but created their own art pieces. "That was great because they were influencing each other," Ferrara says. Another facet of STEAM that everyone seems to agree on is the need for students to fail, and fail often. "We call ourselves a school of wrong," says Cameron, whose University Place school brought in Yakman to work with teachers to design a STEAM curriculum. "We want students to be wrong. That way, they're going to be able to critically think, they're going to be able to problem-solve. We say it often, that it took Thomas Edison 1,000 times to invent the lightbulb. We need to let them work through the problems, think for themselves. That's what we think STEAM lends itself to." The Taylor Elementary teachers also stress the need to try and fail, and they are careful to model this for the students. For Ferrara, this means showing up at Ashley's art classes and letting the students see his struggles with art, or telling kids to look for answers to their iMovie questions on the iMovie forums, because he's not an expert with the application. For Sanchez and Ashley, that means sitting in on classes about the Fibonacci sequence, because they don't quite have it down. Across the board, schools that undertake STEAM's hands-on approach to learning see their students opening up in ways they hadn't foreseen. Cameron notes that STEAM gave a student at University Place the chance to program a robot to drive out of the classroom, go down the hall, say hello to another class, and come back. "A standardized test is not going to tell you that he can do that." Cameron says. "And I couldn't do that, write a program like that, but it's right up his alley." The Taylor Elementary teachers share similar stories: of a kid who never speaks growing animated when describing his Chesapeake Bay project, or an autistic boy creating a beautiful sculpture from rocks and sticks to reflect elements of Fibonacci that many of the other students didn't understand as well. For Yakman, the revelations come out of new ways of approaching academics, as well as the teamwork inherent in STEAM: "The kid who's in the top of the class, who thinks they can do everything, gets a little humbled when they see that other kids can do things they can't. And the kid who thinks they can't do anything, all of a sudden, they're shining stars because the teacher has found a thing they're good at, and they can focus on that strength." Teachers looking for STEM inspiration can find it in free, online minicourses offered through HP's Catalyst Academy. These courses, which are offered as online workshops, minicourses, or MOOCs, are aimed at teachers looking for ways to innovate their STEM "plus" curriculum. Technical solutions dominate --we're talking HP after all-- but courses cover subjects including how to leverage social media platforms such as Facebook and Twitter in the classroom, strategies for creating a challenge-based approach to teaching climate change, or how e-portfolios can be used to explore STEM competencies. Educators who complete five minicourses earn a Catalyst Academy STEMx Expert badge. The courses were created by HP Catalyst Academy Fellows, which are organizations from around the world that have won $16,000 HP grants to develop the courses. These organizations range from educational research institutes and foundations to universities and schools. Different classes are offered for different periods of time, but all are "learn at your own pace." In courses where there is a moderator, participants must participate within a set time frame, while other classes provide open enrollment indefinitely. The complete course listing and course requirements are here.